Does your company have an idea for a novel biomarker test, but you’re unsure what the market potential will be? Have you invented a more sensitive test to diagnose a common autoimmune disorder, and but are unsure of what regulatory pathway to pursue? The process of developing a successful in vitro diagnostic (IVD) relies on the expertise of a diverse group of individuals, including the scientists who identify the biomarkers of significance, engineers and assay developers who translate those ideas into a tangible product, and the sales and marketing staff who will get your product into the market. With a topic as complex as IVD development and commercialization, it became obvious that there was a real need within the industry to have a source that could serve as a reference guide. 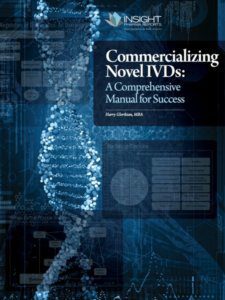 This unique manual will provide an overview of the major components to IVD development, from product conception through commercialization, and important considerations about individual aspects of the process.